慓lebe Garth� is steeped in history. 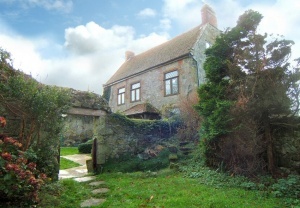 The west wing (also known as the old rectory) was added in Georgian times and was the original rectory to St. Andrew抯 church at Chale. The property was listed in 1993 to preserve the notable architectural features of the building. 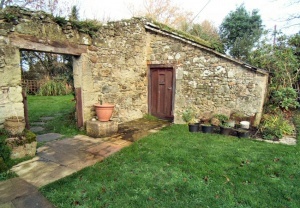 The attractive stone of the house, apparent in the ashlar quoins for instance, is also reflected in the garden where it has been used to form walls around the various areas of lawn and paving as well as being the fabric of the outbuildings. Inside the property are a wealth of character features including impressive fireplaces, exposed stone walls (some 18 inches thick) and oak beams said to have come from the shipwreck of the West Indiaman the Clarendon, after which the local inn is still named. 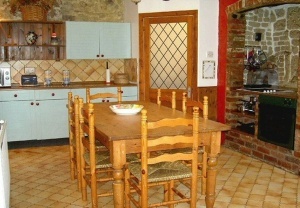 The kitchen boasts a large brick and stone fireplace with original bread oven. There are two bedrooms and a bathroom on the first floor and at the top of the house a further two bedrooms one with en-suite facilities and both with high pitched beamed ceilings. From the upper floor the sea can be seen to the south and there are pretty views of the countryside from many of the rooms. The property is fully double glazed. 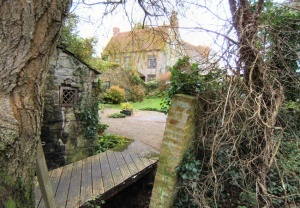 From the driveway parking at the rear, with private parking for at least 3 cars, there is a bridge across a stream and through a stone paved courtyard with its own stone built Georgian double w.c. with pitched tiled roof and decorative window. 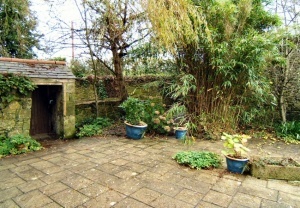 Attractive archway through high stone wall to path to entrance porch with tiled roof and oak pillars. Two front doors, one to entrance hall with leaded windows, the other leading directly into the kitchen-diner. Three windows and hatch to kitchen. Two of the windows sit above and either side of the impressive open fireplace and highlight this beautiful feature. 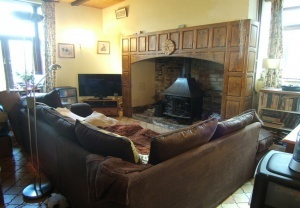 The stone hearth and inglenook currently house a wood burning stove and there is a large panelled wood surround. The stove has a back boiler which powers the central heating system. 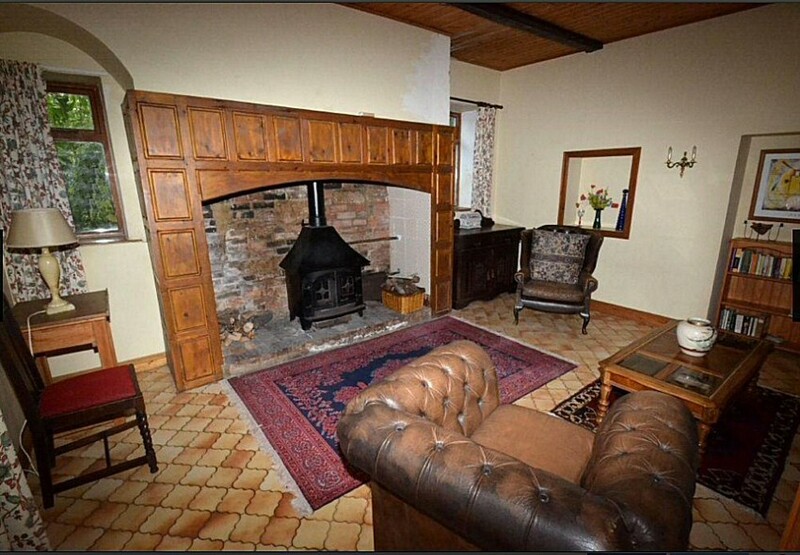 There is a tiled floor, tongue and groove wood ceiling with exposed beam and radiator. KITCHEN-DINER: 16�x 12�br />Window and door to front, both with leaded light glazing and hatch through to living room. Tiled floor, part tongue and groove walls, central exposed ceiling beam. Radiator. A range of base and wall kitchen units with double sink with mixer tap. Large original brick and stone fireplace currently housing electric oven and hob with storage space and original bread oven. Window to side. Space, power and plumbing for appliances. Tiled floor. 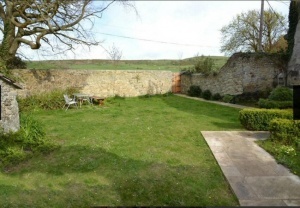 Attractive exposed stone wall, window to front. BEDROOM ONE: 16�x 12�br />Leaded light window to front. 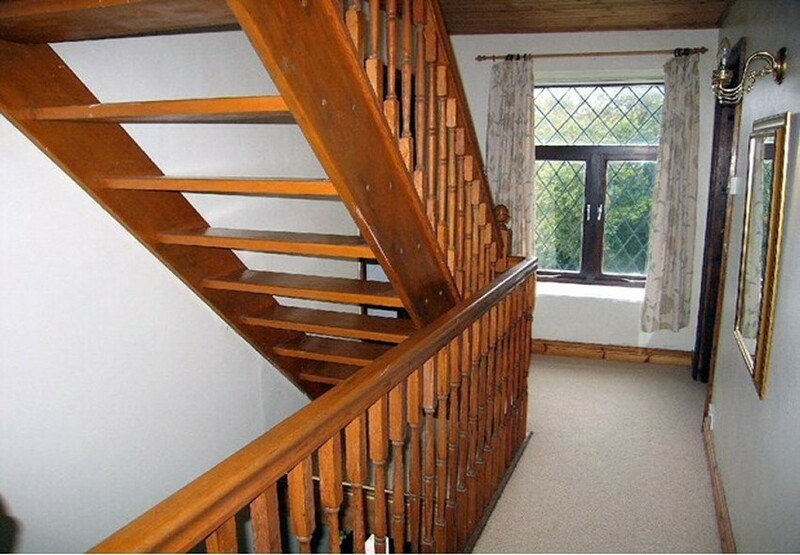 Exposed wooden floorboards, radiator. Recessed alcove. BEDROOM TWO: 10�x 10�br />Leaded light window to front. 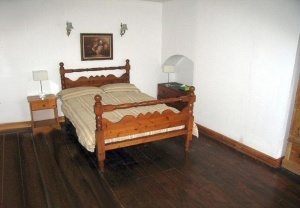 Exposed wooden floorboards, radiator. Leaded window to side, tongue and groove wall and ceiling. An older style coloured suite with panel bath, low level w.c., pedestal wash hand basin, bidet. Radiator and vinyl flooring. BEDROOM THREE: 16�(max) x 12�br />With window to side, high beamed pitched ceiling, radiator. EN-SUITE: Shower, w.c., wash hand basin. Accessed directly from the stairs, two windows to side and rear. Radiator, high pitched beamed ceiling. 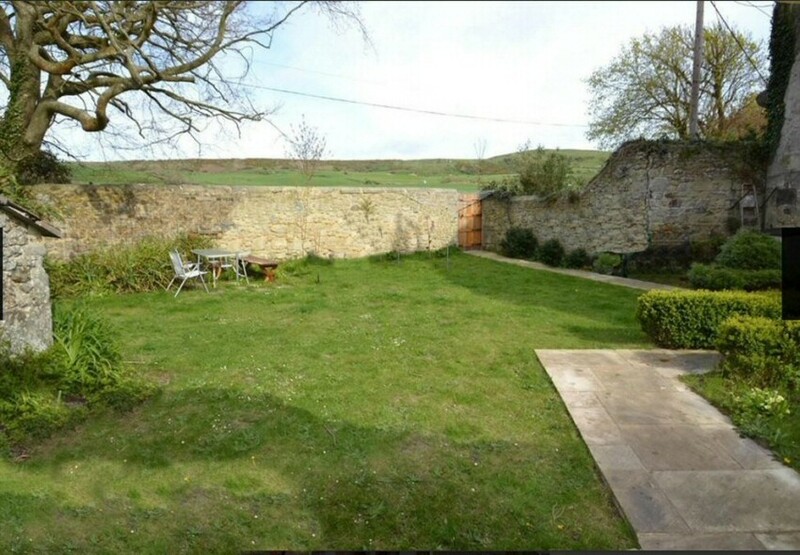 慓lebe Garth� has secluded areas of walled gardens with two large stone built sheds; one was an old smithy with original flagstone flooring and the other a small pony stable, both used in olden times by the incumbent rector. Another intriguing outbuilding is a double Georgian outside w.c. said to have contained a love seat (no longer in existence) which straddles the stream. 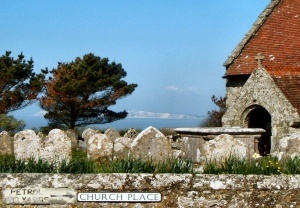 This stream finds its ultimate destination at Whale Chine. There is also access through a gate in the tall stone wall from Chale Street. The garden has well stocked borders and mature trees. Strictly by appointment through the vendors� sole agents 01 Estate Agents.